Shahid Afridi's career can easily be divided into two phases; the first phase was when the team tried to make the world believe that he is a batsman who can bowl a bit, and the second phase was when the world was made to believe that he is a bowler first and then a batsman. No other cricketer has suffered more due to this confusion. Not only were the board, coaches, management, and other players confused about what Shahid Afridi is, he himself probably was, and is, confused about it as well. Despite all this, there should be no confusion about one fact. The fact that Afridi is one of the biggest match winners ever produced by Pakistan. Here are some myths about him, which his critics love to bring up every now and then, and the related facts, which prove that the myths are not really true. Question: So how many ducks does he really have in ODIs? And how often does he get out on a duck? Fact: He has 29 ducks in ODIs, which is the 2nd highest number of ducks after Sanath Jayasuriya. His 29 ducks in 356 ODI innings means that Afridi gets out for no score on average every 12th innings. Does anyone know what that means? i.e. getting out for a duck every 13th innings? How does that compare with other cricketers? The answer is in the table below. There are some interesting names in there of batsmen who get out on a duck more often than Shahid Afridi does, such as Chris Gayle, Andrew Symonds, Brendon McCullum, Younis Khan, Herchelle Gibbs, to name a few. Moreover, out of the 88 innings in which Afridi has batted at number 7, only 5 have resulted in a duck. That number is less than the number of ducks that others have registered batting at 7, including Chris Harris, Ian Healy, Wasim Akram, and Kapil Dev. While at number 8, Afridi has registered 3 ducks in 34 innings. Question: So does Afridi really score only once in 10 innings? Has he really performed with the bat in only 10% of the 356 ODI innings he has ever batted in? Fact #1: Well the fact is that Afridi has scored 30 runs or more in 94 ODI innings. That is a 30+ score in every 4th ODI innings. I have used a benchmark of 30 because that is what I believe refers to as a good average for a bowling allrounder. Fact #2: In 88 ODI innings at number 7, Afridi has scored 27 or more runs in 24 innings (every 4th innings). And in 34 ODI innings at number 8 he has scored 24 or more runs in 12 innings (every 3rd innings). I have used the numbers 27 and 24 because those are the respective average scores of batsmen who have scored over 1,000 runs at number 7 and over 650 runs at number 8. I really think that this shows that Afridi does fulfil his role with the bat more often than not. Question: So does Afridi win any matches for Pakistan? Does he win 1 in 10 games for Pakistan? 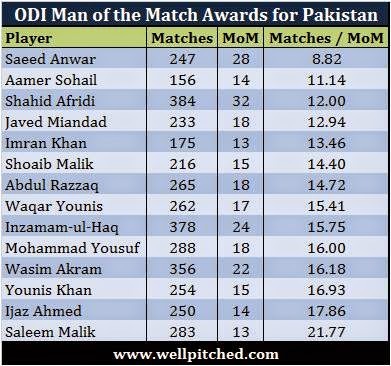 Fact #1: Afridi has 32 man of the match awards, the most by any Pakistani and the 3rd highest in the world, in 384 ODIs. That means that he wins a man of the match award in every 12th ODI, meaning he puts in a match winning performance every 12th ODI. That is a match winning performance more often than all Pakistani cricketers (barring the opening duo of Saeed Anwar and Aamer Sohail) that have won at least 10 man of the match awards in ODIs. Fact #2: Pakistan has won 212 out of the 384 ODIs that Afridi has played in, i.e. a 55% success rate. His batting average in matches won by Pakistan is 30, a good 7 runs more than his career average of 23. 5 out of his 6 ODI hundreds and 27 out of his 36 ODI 50s have come in matches that Pakistan has won. In those 212 ODIs that Pakistan has won, Afridi has taken 271 wickets at an average of 25.3, which is a remarkable performance for a spinner. That average is a good 9 runs less than his career average of 34. All of his four 4-wkt hauls and nine 5-wkt hauls have come in matches that Pakistan has won. Now tell me, if those aren't figures of a match winner, I wonder what are! Question: So does Afridi fulfill his batting role at number 7 or 8? 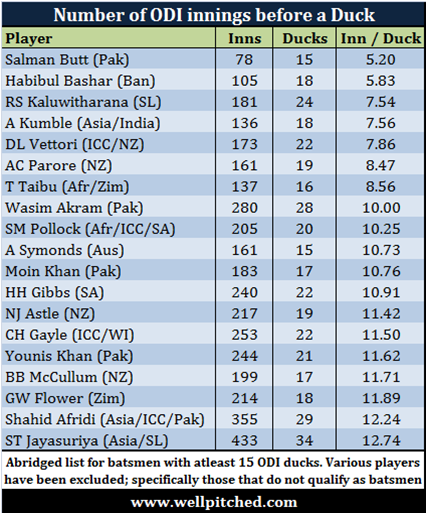 Before I present the facts, let me state that Afridi is the most scrutinized number 7 or 8 in the world. No other cricketer who regularly bats at 7 or 8 is scrutinized as much and as seriously as Afridi is. For a large part of cricket history, batting was the role of numbers 1-6, wicketkeeping the role of number 7, and bowling the role of numbers 8-11. It is a more recent phenomenon that wicket keepers and bowlers are required to contribute with the bat. Fair enough, a bowler or keeper who can bat well at number 7 or 8 gives an ODI team more batting depth. Fact #1: Out of all ODI number 7s in the world, Afridi has the 3rd highest runs tally and the best strike rate. 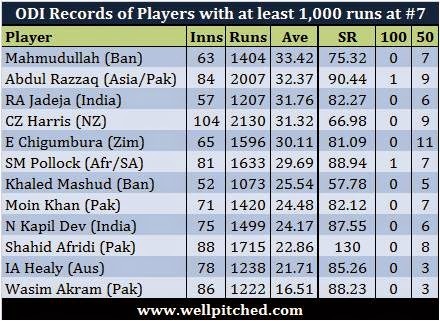 His average among all batsman who have scored at least 1,000 runs in ODIs while batting at number 7 is the 10th best in this world. And that is out of hundreds of cricketers who have batted at number 7 for their team. If anything, that outlines consistency really. What is the role of a number 7 in an ODI? To either save a sinking ship when coming in at 100 odd for 5, or to accelerate at the end of an innings when coming in at 200 odd for 5. You can't expect much of Afridi in the former situation, but in the latter situation, it works more often than not. And why should you expect anything from Afridi when your frontline batsmen have failed? 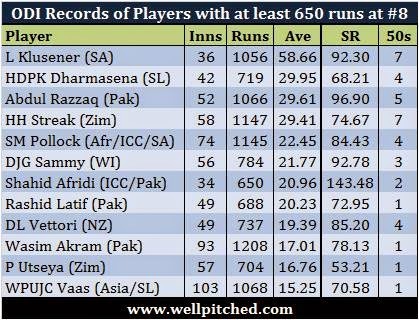 Fact #2: Out of all number 8s in the world with at least 650 runs, Afridi has the 7th best average, and the best strike rate. The man bowls, the man bats, the man fields, and the man also leads from the front. What else does one want? Take Afridi out of the eleven and you will require four players to fill his shoes. One to bowl and pick up wickets, one to smash it around, one to field, and one to keep the chips up when they are down! Do you really know anyone who can replace him? Cricket ki tareekh aapka shukriya adaa karti hay.. for busting the myths. Also must point out all the stats you have put in: are the overall stats....Not the recent stats....He has aged terribly, you can't live in the past....You have to put his recent performances rather than when he was at 18 years old....He didn't take a single wicket before australia for seven games....And didn't score any runs in excess of 30 for god knows how long.......So his inclusion in the team baffles me....In cricket form is everything...if you look at the stats, wasim and waqar should still be playing, along with inzamam and mohd yousaf....Why are they not playing? Check their stats....they are amazing.....Hope i have made a point here......Cricket is a huge Research and Development (R&D) project....Youngsters will get valuable experince...and hence will get better.....Older players can't get better.....as they hit a brick wall.....One more question for you....If an older player is scoring the same amount of runs, compared to a younger player...who will you choose...???? It is ok to disagree... everyone is entitled to their opinion.. yet facts always speak louder than opinions.. Excellent fact based analysis. It cannot be disputed that Shahid Afridi is definitely a great cricketer and a match winner to boot. Afridi didn't take one wicket before Australia, in 7 matches on spinning tracks, and need i mention he is a spinner...........Further didn't score once in excess of 30.....Besides he didn't turn the world on its heads against Australia as well.....Cricket is form based sport, not stats...His form is shocking....Misbah sat out because he didn't perform in the last 3 ODIs, why not afridi..??? Why these double standards?? And since u r such a stats master, why don't u tell me who was Pakistan's best bowler in the ODI series against Australia? It is ur opinion that he is over the hill... his more recent bowling form suggests otherwise..
Lol, i am not getting personal with anyone. I also mentioned that in my last post....You put a stat for me, and i put a counter stat.....Where is the personal grudge... I for one don't see it....??? The different games that had made the player Shahid Afridi look out from the rest was that he has enormous potential to make quick runs and Shahid Afridi sixes are famous in International Cricket.